Pikachu, Charmander, Chikorita and Piplup are playing when a Mew appears in front of them. He requests Pikachu's help, as there is a crisis at the PokéPark: The pieces of the Sky Prism have gone missing. Pikachu agrees and Mew teleports them to the PokéPark. PokéPark is a large resort populated entirely by Pokémon. 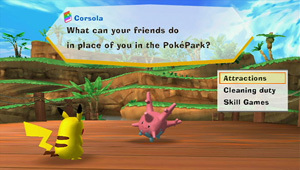 You play as Pikachu, exploring the park, taking part in minigames to befriend other Pokémon and then using any Pokémon you have befriended in the park's attractions. You can take photos as you play and save them to an SD card for transferring to personal computers or other devices.